Note that this is the trajectory of a booster during a high-performance mission, and does not include a boostback burn. 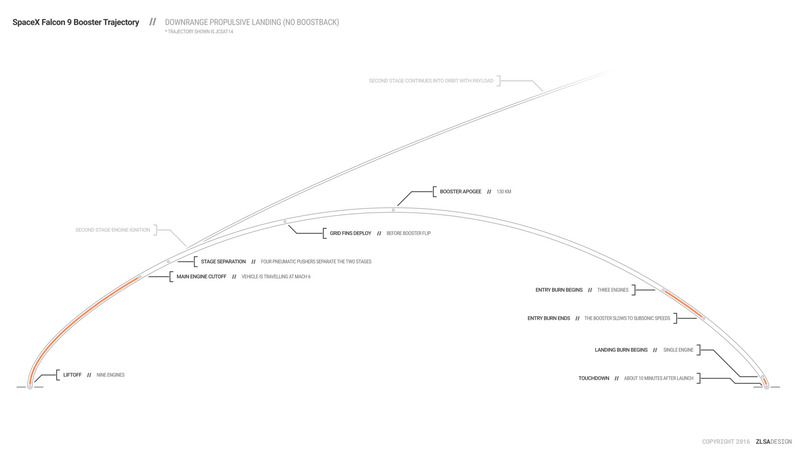 The approximate trajectory of a Falcon 9 landing with a boostback burn can be seen here. The Falcon 9 coasts through its apogee on a ballistic trajectory. At about 8km in altitude, the landing burn begins. On most missions, this is done with only the center engine; however, on some high-performance missions, three engines are used instead. Three-engine landing burns use less fuel but are also more risky; however, they allow the booster to provide more velocity to the payload than a single-engine landing burn. The trajectory of the SpaceX Falcon 9 booster in this infographic is based on Flight Club’s recreation of the JCSAT-14 launch trajectory.